Here are some more "Pearls from the Master", spoken by Moyse on Technique continued from part 1 of this series on Moyse's teaching in the 1970s. The quotes are from Jerrold Pritchard's trip to Brattleboro in 1977. We both have added our comments to elucidate the meanings of these quotes. Like a baby learning to walk, he can do better with the aid of a chair. Walk before you run. Try several times. Jen explains: Simplify a challenging technique into tiny steps that can be performed easily. Sometimes you actually have to go right back to basics for a few minutes. Perhaps something about your breathing/posture/headposition/lip position may indeed be getting in the way of mastering a new technique. Master the technique with several attempts at simpler and simpler small groups of notes. It's better to layer up the skills rather than get frustrated by trying to do too many things at once. Even one or two notes is not too few. Gradually expand the new skill or technique back into the chunk/phrase/piece of music. Don't try and do too much all at once. It's human nature, but it wastes time. Prepare the lips and tongue for the attack. Jen writes: If you only think to add the embouchure and tongue AFTER you've already played, it's too late. Explosive air speed can cause the lips to splay, distorting the tone. Set the lips in a containing position in preparation for the increased airspeed and volume of air that is used in tonguing. If you bicycle too fast, you break your neck. Miss a note you still live! Jen explains: Don't worry about the odd missed note. You can still practice a fast run-through just to observe where things stand with your preparation. Even if you miss a note or two, you'll learn alot about the lightness of fast playing by attempting it from time to time within your practice. 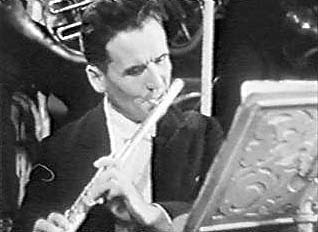 Fast playing often takes a different hand sensation, finger sensation, flute balancing, and general embouchure chosen to play many notes in a row. Don't stay at slow tempi so long that you don't attempt fast tempi just to discover these changes. Don’t sit the flute hard on the lips and teeth for too long—the lips will go on strike! Jen writes: If you use excessive pressure, pushing the flute into the lip and teeth, your lip will eventually become numb and less active. Lighten the pressure against the chin to play flute for longer and longer without fatigue. Make a point of lightening the pressure. Teaching is important too—not all will be virtuoso! Jen writes: Many of the young performers in a masterclass dream of being virtuoso soloists and orchestral players. But with so few chosen, the rest will become teachers, possibly. So listen carefully when following the master's instructions. You may end up using them for teaching, rather than becoming a world-class soloist. 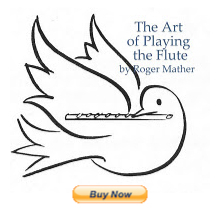 Not everyone is obliged to play the flute! Jen writes: Flute playing at the highest levels is perhaps not for everyone. It's possible that you have set your goals so high that you can't even get half-way there. Take your time and really learn the techniques. If you think you already know them, look at them again to make sure. this earth. Practice — God will help you. J. Pritchard clarifies: This is clear exaggeration for effect on the student audience. Moyse wishes the students to realize that improvement and proficiency will not come without concerted effort and diligent practice. Dance cheerfully: there is more energy in his feet than in a flutist’s brain…sometimes. In pianissimo entrances, use the trill keys like an octave key on a saxophone to make the middle eb, e, and f response softly and quickly. J. Pritchard adds: This is a nice trick that you obviously don't want to use too much or unnecessarily, but, if you are in a situation where you can't keep the pitch up when playing pianissimo, or your lips are tired an inflexible, just cracking open the trill key (the first key works best for me) a tiny bit will make the octave jump. You then may be able to let the trill key close again once the note has stabilized. There definitely is a change in tone color when you use the trill keys and in some situation this won't fit the music, but having a harmonic sound is better than cracking the note, being out of tune, or not having the upper note respond. J. Pritchard writes: The issue here is to impart lightness and quickness by starting the grace note with the finger above the key that produces in the quick acciatura. Particularly in a spot when the grace note uses a key with a spring to bring it back down or up (AB-F; EB-D; B-C, etc, you can let the spring push your finger back up. Starting with the finger on the key of the grace note means you have to physically lift the finger with muscle action going up and down. In a quick E-F grace note before the beat, you can let the downward action of the finger rebound up with the spring doing much of the work. This technique requires very good timing and coordination of the tongue and release of the breath, but is worth the effort and imparts a kind of lightness to the figure. Success? You can get famous playing bad notes, too! J. Pritchard writes: Or, if you play too many wrong notes, you become "infamous" ! Actually a great performance by a virtuoso is a bit of an illusion at times, because what may be needed is an effect not a perfect note or leap. J. Pritchard adds: This remark about the speed was one of Moyse's pet peeves. He would have much preferred a student to play more slowly and beautifully with singing tone that was at a speed you could savor and enjoy. He really chides a couple of students who came with some big piece with flying finger in an attempt to impress him. I recall one very pushy individual [who it turned out was not a paying member of the class and who disappeared after the first class session) who played first in the class and started out with a very difficult pieces with many, many 32nd note passages at a rapid tempo. He got about half way through and realized that Moyse was not impressed by speed and brilliant playing –especially if not done perfectly--and was looking at him with amazement and disapproval. The fellow began to falter, to make mistakes, and even shook in lips, tone and fingers from nervousness...he finally ground to a halt. And after a moment of tense silence Moyse smiled and said: "Now we begin. “ And proceeded to work on some basic issues of tone control and development of a singing style. A complete pdf printout of all of Moyse's pointers and their explanations is free to download here. simply brilliant. Thank you again for al your work on this " special"
Thanks Wendela. I just love this stuff myself!